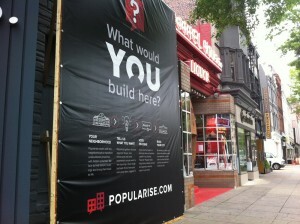 A large sign for Popularise.com asks passersby to weigh in on what should open at 14th Street and Rhode Island Avenue NW. Miller says that his website isn’t shutting people out from the conversation, but rather widens it. 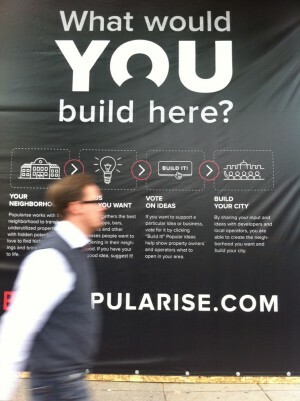 Real estate development is an “opaque” process, he says. (Ben Miller, 35, grew up in D.C. and his father is well-known developer Herb Miller, whose company had a hand in Gallery Place, Potomac Mills and Washington Harbour). Still, it’s clear that the website thus far has appealed to a particular demographic. According to the site’s data, the typical user is between 25 and 34 years old, lives near H Street (which makes sense, given their first project’s location) and likes frequenting Little Miss Whiskey‘s and Rock and Roll Hotel. But Miller says the site is essentially a self-organizing tool, and anyone can become part of the process. Community groups in other parts of Northeast have already approached him for help on revitalizing commercial corridors. United House of Prayer, which has helped build affordable housing in the city, is using the site to help develop some of its vacant properties, Miller says. Miller doesn’t view his website as gentrifying neighborhoods since most of the projects involve vacant or blighted buildings. He calls them “win-win” properties, places people want developed. For instance, there are few sit-down restaurants east of the Anacostia River, something residents have complained about. Miller says opening nice restaurants there would be an example of growth in an underserved area, not gentrification. “My experience is everyone wants good schools, good services and a beautiful neighborhood,” Miller says.